Ready Made Garment (RMG) workers continued their demonstration for the sixth day (Saturday) by blocking roads and streets in the capital and its outskirt Savar, Ashulia, Tongi, Board Bazar and Nabinagar areas. They vandalised at least five factories and over 20 vehicles, including passenger buses,Â in city's Mirpur, Ashulia and Tongi during the protest against the disparity in their new wage structure. At least 30 workers and 10 bus passengers were injured during the clashes between agitators and cops personnel. Over 30 garment factories have been seen shut during the clash on Saturday morning. With the latest closing, over 200 factories were shut in the last few days, workers and police said. The RAB-1 Commanding Officer (CO) Lt Col Sarwar Bin Kashem called them (detained workers) as terrorists that already has created huge panic among the demonstrators. "They carried out destruction in the garment factories revolving the workers' protest"
However, the RAB official immediately couldn't disclose identities of the five detainees. In capital, the agitated workers equipped with sticks vandalised two factories, Banex Apparels Limited and Load Star Limited, in Section 13 of Mirpur around 11:10am. The protesters from nearby factories in the area first called the workers of the two factories to join them in the protests. As the workers of the two factories denied their call, a group of around 50 to 60 workers of other factories start pelting brick chips at the office building. At one stage they entered the office and carried out the vandalism. Following the incident, authorities of the two factories were forced to stop their operation.Besides, several factories on the Mirpur-Kachukhet road were kept shut as the agitated RMG workers staged demonstration on the road around for three hours starting at 10:00am. Authorities of all factories in and around the area were forced suspend their operation amid the violence. A group of workers of some garment factories staged demonstrations at Technical intersection around 10:30am blocking one side of the Mirpur Road, Farukul Alam, said OC (investigation) of Darus Salam Police Station. The agitating workers took position on a road near Government Bangla College at that time, halting vehicular movement in the area around 1:30pm. In Rokeya Sarani, the workers are also staging demonstrations on Begum Rokeya Sarani road in Shewrapara and Mirpur-14, said Dadon Fakir, OC of Mirpur Police Station. Besides, workers in Mirpur section-14, Tolarbagh, Technical and Govt Bangla College areas, to show agitation. Vehicular movement came to a halt as the protesters have blocked roads, said Kafrul Police Station Sub-Inspector (SI) Ashraf. 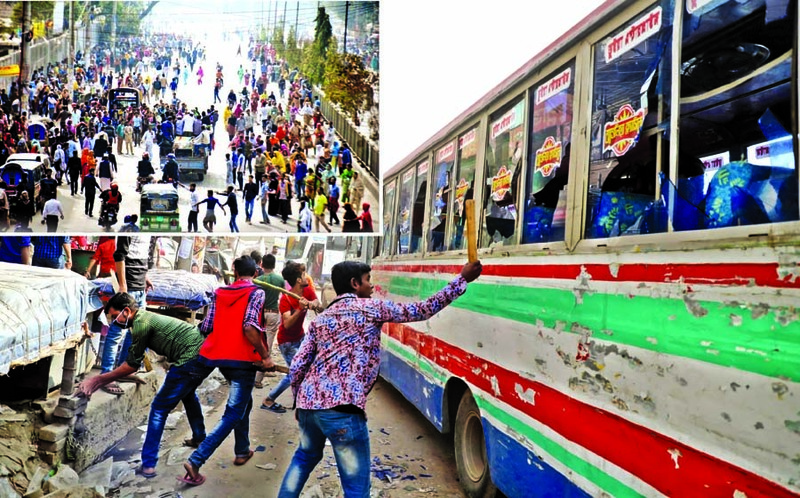 In Ashulia, the RMG workers vandalised at least 20 vehicles on Dhaka-Tangail Highway in Ashulia, on the outskirts of Dhaka while staging demonstration over the same issue. Nearly 20 people, including bus passengers, were injured when police charged batons and used water cannon to disperse the protesting workers around 11:00am. In Tongi, at least nine factories in Tangi were vandalized by the agitated garment workers in Tongi area in the morning. RAB-1 detained five workers for their alleged link with the vandalism. State Minister for Labour Monnujan Sufian has promised that none of the workers will receive a lower wage than they did before. Dhaka Metropolitan Police (DMP) Commissioner Md Asaduzzaman Mia on Saturday said that police would take stern action if any third party tries to influence the workers or take advantage of their protests. "We will investigate whether any individual or parties are trying to use the protests to their own ends." Asaduzzaman added the government was sincere in providing a solution for the ongoing crisis. "We hope the issues will be resolved within a day or two." A special committee headed by Labour Secretary Afroza Khan has given assurances that it will review the allegations regarding the three wage grades coming from workers. The workers have alleged that the monthly wage in the seventh grade increased to Tk 8,000 from Tk 5,300 as per the latest gazette published by the government last year. But, the salary of the workers in other grades did not increase at the same rate. The salary hike for the entry-level workers was more than that of their senior operators, who have been working for more than seven to eight years. The new wage has been effective from December 1. Major disparity in the salary hike was noticed in the third and fourth grades as their salaries were not raised like that of entry-level workers.